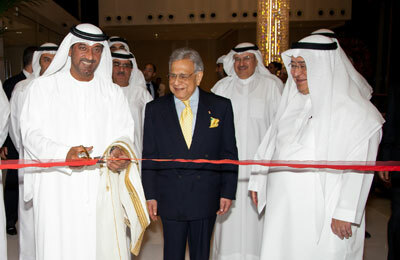 The Oberoi, Dubai, a new five-star luxury hotel in Business Bay, was officially opened yesterday (November 4). It was inaugurated by Sheikh Ahmed bin Saeed Al Maktoum, President of the Department of Civil Aviation, CEO and chairman of The Emirates Group and chairman of Dubai World, in the presence of Sheikh Adel Al Aujan, chairman of Aujan Group Holding, and PRS Oberoi, executive chairman of The Oberoi Group. Dubai-based Aujan Group Holding is the owner and developer of The Oberoi, Dubai, which opened for business in June. “The Oberoi Group's commitment to excellence, attention to detail and personalised service makes them one of the leading hospitality providers worldwide and an ideal partner for Aujan,” said Sheikh Adel. Oberoi said: “The hotel is The Oberoi Group’s first property in the UAE. So this occasion of the inauguration of the hotel represents a significant milestone for the company and for me personally. The Oberoi, Dubai is a contemporary luxury hotel that overlooks the Burj Khalifa and features 252 luxury rooms and suites with floor to ceiling windows, besides a 24-hour spa and a wellness centre with a gymnasium and an infinity swimming pool. It offers three signature restaurants – Umai, featuring contemporary Asian cuisine; Ananta, a specialty Indian restaurant; and Nine7One, a world cuisine restaurant.